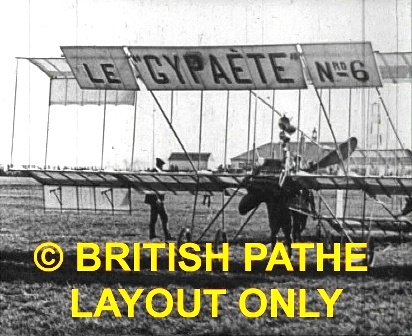 Blackpool Aviation Meeting 1910 Pathe - Flying display. Duration: 5 minutes 03 seconds. Crowds inspect aircraft lined up in front of hangars. Airmen climb into the planes and test controls before taking off. Aircraft taking off and flying around the course. Le Gypaete biplane with Farman at controls. Various aircraft taking off and giving flying display; the bungalow in the background is the clubhouse of Blackpool South Shore Golf Club.